Now, social network is popular on internet. How many social network account do you have? For me, I really do not know how many I have, because a lot of sites I registered just for test. If you are a normal user maybe you have three or five accounts, how can you do if you want post a picture or a video to your all sites? Most time we just sign in site by site, upload stuff, and post them. Pixelpipe is a new site that offers an amazing service, you can upload your photo, video, or music to multiple sites once time. To use it you need register an account, pick which services you want your files distributed to, fill your original site's ID and password. You can pick multiple servers that Pixelpipe supported. After all set, you can upload your stuff to Pixelpipe, and it will send this stuff to multiply sites for you. 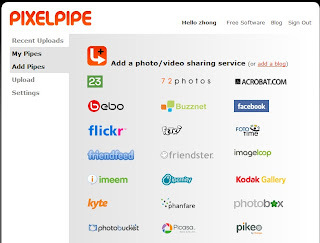 Now, Pixelpipe supports many social network sites, included Facebook, Imageshack, Youtube, Box, and many many, even it supports mail, ftp servers. Now, Pixelpipe is not open to public, it requires invitation for register. If you are interesting about it you can grab this invite code: ReadWriteWeb08. Have fun!